It's a highly volatile period for the company and its sector. 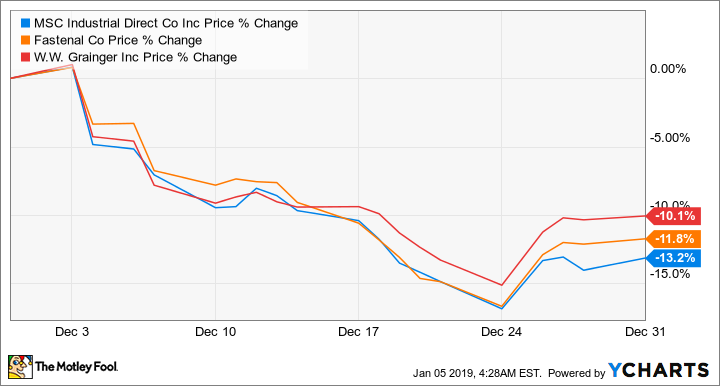 Shares of MSC Industrial Direct (NYSE:MSM) fell 13.2% in December, according to data provided by S&P Global Market Intelligence. The move sounds dramatic, but to be fair, it looks like more of a sector issue than a stock-specific one. A comparison with its peers like Fastenal (NASDAQ:FAST) and Grainger (NYSE:GWW) shows that the decline was pretty standard across the industry. However, the decline December comes after a good rise in the sector during November. For example, MSC Industrial stock rose 9.3% in November, with Fastenal up 15.3% and Grainger up 10.6%. Has the market gone mad and randomly decided to buy and sell the sector off by double digits in alternate months? The nonfacetious answer to the question lies with the trade dispute with China. The move upward in November was probably due to a sense of optimism leading into the meeting between President Trump and Chinese President Xi Jinping at the end of the month. As the meeting failed to produce a satisfactory settlement, and economic data from China continued to worsen, it's not surprising to see the sector sell off again in December. China is important to MSC Industrial in two ways. First, industrial supply companies source many products directly from China or from manufacturers that source components from that country. For example, Grainger CFO Tom Okray argues that 20% of the company's U.S. segment cost of sales comes from products emanating from China and a 25% tariff would increase the segment's cost by 2%. Turning to MSC Industrial, CEO Erik Gershwind attempted to allay investor fears regarding the matter by arguing that the company's "direct and indirect exposure comprised slightly more than 10% of our cost of goods sold." He added, "Less than half are on the current tariff list, making our exposure to cost increases at under 5% of our total cost of goods." He went on to discuss the "likely outcome" of tariffs stimulating "inflation across the broader economy and this would be a positive for us as long as demand trends hold and we achieve historic levels of price realization." 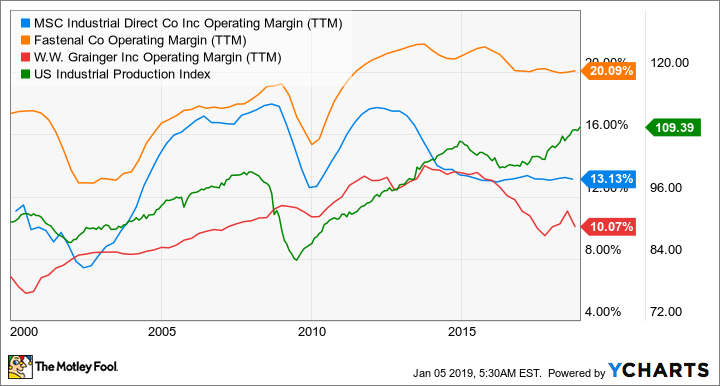 That's all well and good, but the simple fact is that operating margins across the industry haven't recovered in line with U.S. industrial production growth in the way they did in previous cycles. In other words, it's hard to argue the case that MSC Industrial has significant pricing power right now, so any price increases from China could come at the expense of its profits. The second reason is more prosaic: A slowdown in China and/or heavy industries that depend on end demand from China could slow global industrial production growth -- not good news for MSC Industrial. Industrial supply companies are very good bellwethers of manufacturing conditions. Wait and see. An easing of tensions in the trade conflict and a concomitant pickup in growth in China would be good news for MSC Industrial. On the contrary, China's failure to comply with President Trump's demands would presage more disruption. Until there's more clarity on the issue, MSC Industrial's stock is likely to be volatile. Check out the latest MSC Industrial, Grainger, and Fastenal earnings call transcripts.